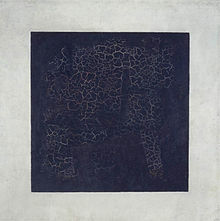 Kazimir Malevich, Black Square, 1915, oil on canvas, Tretyakov Gallery, Moscow. I’ve been practicing a kind of theological minimalism for a long time now. This impulse toward minimalism is itself religious. And it’s aesthetic. It doesn’t have to do with whether particular things are true or false (though, rest assured, such judgments must also be made), it has to do with the feel (literally, the aesthesis) of Mormonism as it’s lived. What shape does Mormonism take when I live it? What shape does it take when it’s lived in the body of a married, well-fed, middle-aged, over-educated, white, American, twenty-first century male? A community college philosophy professor? An avid reader of high-brow fiction? A lover of college basketball? A student of contemplative practices? A father of three? A runner? A suburban mortgage holder? Can the shape it takes be beautiful? Can it, at least, not be ugly? Can it be Mormon? These are aesthetic questions. And, as I said, for a long time now my impulse has been toward a kind of practiced minimalism. Still (and maybe I’m kidding myself), it feels quite explicitly like our Mormon God has himself urged me toward this kind of theological asceticism, toward dispossession, toward parsimony, toward modesty, toward the faithful adoption of a theological poverty. How much can I do without? How many ideas can I give back to God? How far can things be pared down? How bare of belief? How sharply honed can thinking get before it becomes thoughtless? How naked can a religious life be and still be religious? Still Mormon? Like a desert father, I’ve been fasting (and praying and fasting) for years—but I haven’t been fasting with food. My thin ribs attest a Mormon minimalism. Some elements are occluded by such experiments in minimalism. This is true. But some rush to the fore with stark concretion. A black square is all that’s left?! But so black! So square! What can you see? You’ll never see everything at once. And trust what others say they also see. Great article, Adam. Thanks for posting it. I’ve had the chance to visit Walden Pond on a few occasions here in Boston, and urge to “simplify, simplify” grows ever stronger. This remains the thing, Adam. You are moving in the wrong direction. We grow, grace to grace, understanding to understanding, knowledge to knowledge, etc. Until we are full, and whole. You continue to get it backwards, and as the brightest and most interesting writer of your school, you are taking other people with you. Being to being. Life to life. We are added upon and added upon. We believe in continuing revelation for a reason — He not only can say more to me, He does. I believe it’s possible to exercise and grow in such faith that in many instances our vision can not be withheld from penetrating the veil. I don’t believe it just because I’ve read about it here or there, but I’ve experienced it. So the concept of minimalism rings a bit hollow to me. It runs the risk of sounding an excuse for a lack of revelation (what more can he say!) in search of a reason for why revelation is missing in the first place. While I no doubt thing minimalistic traits in life can be praiseworthy, as a faith I think we are definitely focused on expanding and increasing in all manner of ways. If the black square is so minimal as to not have your full name in gold lettering in the lower right corner, its just plain too minimal to be mormon. My question is just that. I’m not with Thomas Parkin in asserting that this is wrong. I’m curious. As a personal aesthetic, I wouldn’t say it’s wrong, There is plenty of time to outgrow personal preferences. I used to really be into the Pre-Raphaelites. I’m not embarrassed by that; but it was a little limiting however overflowing it seemed. That’s not Mormonism, Adam, it’s Zen. And yes, it is beautiful. I presume that it’s your lender, not you, that holds the mortgage. Unless, of course, you run a real estate finance business out of your garage when you’re not waxing philosophical. Amen, Adam! The problem is that contemporary mormonism feels “added upon and added upon”. Minimalism isn’t about reduction for the sake of reduction. It’s about stripping off the excess. It has become nearly impossible to separate the excess from the essential in mormonism. Adam, I’m not sure what as a practical matter you mean by minimalism. Out of curiosity how do you define minimalism while keeping inquiry alive? Or do you see minimalism as entailing stopping inquiry? I ask because the type of musement you advocate in your books seems completely at odds with minimalism. So it would seem that either you really don’t hold to minimalism or mean something by minimalism other than what you appear to mean. P (9), I think there are parallels in some ways between Mormonism and certain minimalist forms of Buddhism. However it seems to me that if we focus on the theology vs. practice distinction that Mormonism definitely embraces a lot of theory. Now I do think that Mormonism puts the emphasis on the lived life rather than theology. So I think Jim is right when he emphasizes an a-theological character for Mormonism. I think he downplays the role of theology perhaps a tad too much. It’s certainly the case that one can be a good Mormon “without having a good theology or much of a theology at all.” (Faulconer, 26) Likewise having a good theology effectively says nothing about how good a Mormon one is. However a lot of Buddhism has a focus on a lot of metaphysics being a “nobel lie” (think of the Lotus Sutra for instance) Mormonism not only rejects anything like this but sees a positive work for theology. It’s perhaps apt to recall that Joseph said, “a man is saved no faster than he gains knowledge.” (HC 4:588) There are lots of sermons like this. So relative to making ones calling and election sure we have, “knowledge is power & the man who has the most knowledge has the greatest power.” (May 17, 1843) and “without knowledge we can not be saved” (April 10, 1842) Of course habits of behavior is a type of knowledge (i.e know-how for riding a bike). I think all of these things suggest that knowledge isn’t just know-how regarding virtue but knowing the economy of God. But isn’t that theology? Y’all are talking way over my head, but I’ll risk looking simple anyway. What if it’s not about theology but ourselves (or more accurately, each other)? Not attaining or striving, but stripping away all that is not? Uncovering/unearthing. That’s the kind of minimalism that makes sense to me – getting rid of, letting go, falling, relinquishing, ceasing all that is superfluous – soul-wise, and maybe physically too. …”over-educated,”? I’m puzzled as to how anyone can become “over-educated” and how that could affect the quest to achieve the subject of you essay. As usual, I’m likely missing a key point. Clark #13, FWIW, my own reading of Adam’s larger project is that the minimalism he’s advocating here is similar to the speculative aspect of theology he’s advocating elsewhere. That is, the minimalism is a commitment not to take any particular theological idea too seriously–to be modest and humble in the search for more light and knowledge, and to be content with the answers that are given instead of demanding that certain (perhaps ill-formed) questions be answered. I have what some might say is a liberal-leaning view of scripture, but when it comes to 3 Nephi 11:28-40, I’m a strict inerrantist. Robert, if so (and I hope Adam chimes in), is inquiry or even musement really inquiry if it doesn’t allow stabilizing onto beliefs. This is related to my comments in the other threads. If belief isn’t volitionally then won’t belief happen as we proceed along musement? If it never happens, keeping to a minimalist project, then have we really engaged with things at all? It’s a similar criticism to what was popular back in the hey-day of the Gen X. If we have ironic distance and never allow the distance to be closed, to care, what have we done? Put an other way if this move of minimalism is really a move of distancing then there really never is the theological play that Adam says he wants. To play with ideas means to bring them close and allow them to appear to me. When they are kept so far away so as to avoid the “danger” that my gaze might be caught by them then really what is being done is avoiding any kind of life. It’s the person saying they are living life by being open to experience when really what is going on is that they are cutting themselves off from experience. No idea if this is what Adam is doing, which is why I’d like him to comment. But it seems this is a crucial problem in at least his presentation. Just to add, I think there is a successful way of dealing with this. Simply adopt a thoroughgoing fallibilism in our actions – much like science does. Then you are able to muse but also allow entities the engagement they demand. Clark, one thought in response, for now. Perhaps a better way to think about at least one issue Adam is grappling is in terms of monastic asceticism (or fasting, as Adam mentioned). Suppose I take a vow to limit myself to 10 words a day. I suspsect there would be a non-trivial sense that I couldn’t say as much, but there’d probably be another very important sense that disciplining myself in this way would eventually allow me to say say more–more with each word, and ultimately perhaps more in 10 words than I could’ve otherwise said in 10,000 words. Why? Because I focus much more carefully on what I am saying. If we apply this monastic principle to theologizing, then I think there’s a strong sense in which limiting our thoughts to some sort of bare minimmum allows us to explore those limited thoughts/ideas/doctrines in significantly more depth than if we didn’t limit ourselves in that way. I think there’s much to be said to the economics of inquiry. (I have a post half-written on this so I don’t want to say too much) That is we have only so much time. Finite creatures like ourselves, worried about our ever impending death, have to decide carefully where to spend our time. That’s because of all our resources time is the most precious. As an aside, Martin (16), I half-wonder if it’s that issue of spending too much of our time on education rather than other practices that Adam has in mind with the quip of “over-educated.” The person who spends all their time only reading the theoretical and never going out there and living life has misspent in my view. During my biannual frustrations with philosophy when I think I should throw it all away I am quite sympathetic. Looking at my shelves of books I sometimes wonder how much of that time could have been spent doing something better. The problem with the ascetic move or the monastic move is precisely that is lacks balance. In the drive to focus on what is important – to be economical – the move is made the goes too far, is too unbalanced, and looses what it seeks to find. It’s akin to the joke of the old “find yourself” movement of the 60’s. In attempting to find themselves they took the route that was least likely to do so. It was by engaging in regular behaviors that we find ourselves. Interestingly the form of quietism I find most interesting is the Zen practice not of monasticism but of finding enlightenment in regular practices such as gardening, food, or even martial arts. It is precisely in doing that we find. I suspect there’s a strong element of that in theology too. I made a few other longer comments at my blog. I think the key issue is risk. Good theology entails risk while minimalism marginalizes risk.